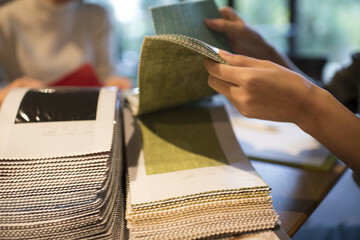 VIP has undertaken a national survey of independent interior designers, specifiers and designers at retail. We have compiled over 20 key statistics that can help designers sell and help distributors improve their selling tools and ultimately increase sales. Below are three of our key findings. If you are a distributor, contact us to find our more about “What Interior Designers Want,” and how VIP is working to improve your business. If you are a designer, look for additional surveys on this site. This is an ongoing nationwide study. So far, a total of 241 designers have participated from California to New York…from Chicago to Dallas. The study has tried to capture a cross section including independent designers, designers working retail, and specifiers. Participants experience ranges from 6 months to 30 years. 100% of the designers surveyed want sample books clearly identified with color on front, spine, back, and ears of books so that they are easy to retrieve no matter how the book is stored. 90% of all designers feel their jobs would be easier if color photos, of patterns, were included on every fabric. If they can’t get photos on each fabric, they feel color photos integrated throughout the book at each design change, or tabbed at the back would be a good alternative.